We all like to start off a new year on a positive note, and when you go to Chinese restaurants, you more often than not get served with Fortune Cookies that tend to carry some positive vibes or words. Well, this time around, if you happen to be the pessimist in the group and host a dinner unwillingly, why not go the whole nine yards by serving your guests the £11.99 Misfortune Cookies, allowing them to enjoy the bitter taste of disappointment. 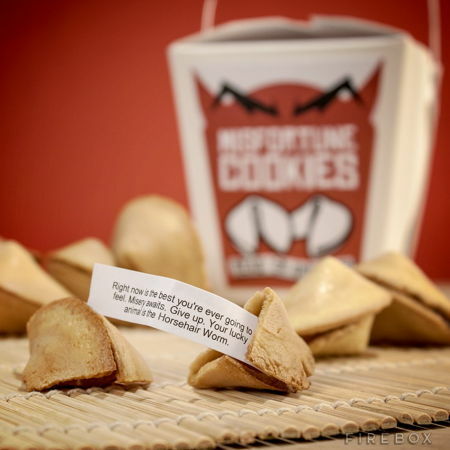 Crack open these cookies and they will reveal a miserable reality, and the disturbing cookies will tell it in a hard hitting manner, just as it is. I don’t think anyone would want to attend your parties any more after that, which sits fine just by you.